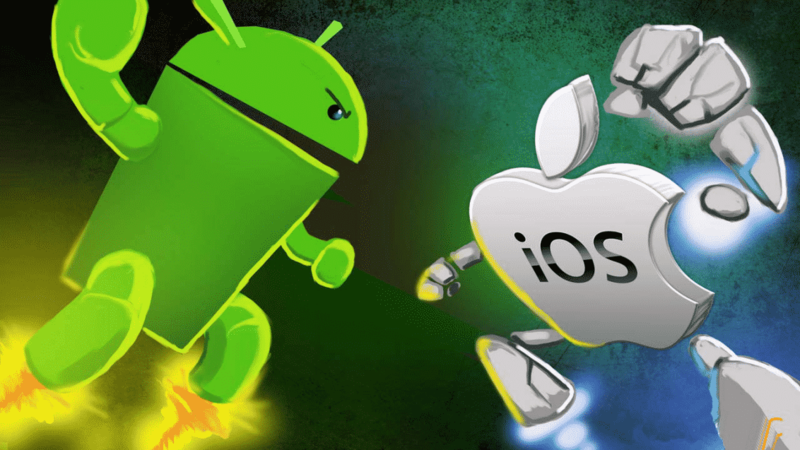 iOS Vs Android: which OS is better? When looking for a new phone, the biggest question is not so much about what kind of device to choose, but which smartphone operating system to choose? The operating system is the main factor that determines how will the phone’s software look and what functions the phone will have. And even though there are many different operating systems on the market right now such as Windows Mobile, BlackBerry, Firefox OS, Bada etc., most of the people limit their options to two most popular systems – iOS and Android. So to make this decision a bit easier for you, we made a list of key categories, that you should take into consideration when you are deciding on an iOS or an Android phone. One of the most important aspects, when choosing a phone, is the availability of different apps. As we all know, both iOS and Android are the superior operating systems, especially when it comes to applications, because Apple app store and google play app store for Androids both offer a ton of different apps. But which one is the ultimate leader? If we only look at the numbers, then Android is the clear winner with around 2.2 million apps available oppose to around 2 million apps available for iOS. But we also have to evaluate the quality and availability of these apps, if we want to make the best decision. So when it comes to these two parameters, iOS will come out ahead because not only many apps have features that are available only on iOS and not on Android apps, but apps also tend to be released for iOS first. But luckily for Android lovers, Android is catching up and slowly becoming more and more popular, which also means that app creators are making Android apps faster and better. So you could say, that in this category its a tie, and you need to figure out what is more important to you – to have more options or to get your apps earlier. For many consumers, a key aspect, when choosing a phone, is the price. As we all know, iOS is only supported by Apple devices, and since Apple smartphones aren’t considered budget devices, you will have to spend a pretty penny to get yourself an iPhone, even if it isn’t the newest model of this brand’s devices. Android, however, is supported many mobile devices from different manufacturers, many of which are budget-friendly smartphones that still have great features. In fact, some top Android devices, like the Samsung Galaxy S series phones rival latest Apple smartphones but also come at a better price point. So when it comes to affordability, Android is a clear winner. Updates are very important for you to be able to have the best experience with using your smartphone. When it comes to Android vs iOS, both platforms are updated on a pretty regular basis. But, if iOS tends to deliver their updates consistently and in a timely fashion for almost all of its devices, then Android provide the latest updates quickly only for their latest releases, but other device users will have to wait a while to get their updates. So, in this category iOS is victorious, however, if we compare only the latest devices for both operating systems than it’s a tie again. Another very important aspect of this OS comparison is privacy and security because it is very important for an operating system to be safe and secure. iOS is well known for its strong stance on privacy and Apple’s efforts to uphold it. Android, however, is less fascinated with keeping your personal information safe. Since iOS devices data is encrypted and can’t be accessed without the appropriate passcode. However, the latest Android OS version, Marshmallow, also now has full-disk encryption, so it is hard to say which system is safer in this regard. But when it comes to malware and hacking, unfortunately, Android devices are more vulnerable, because there are a lot more viruses designed for Android than any other OS, mobile or not. So I have to give the win to iOS in this category as well. For many users, it is important to have options and that they have customized their devices to their liking. The Android operating system gives users this freedom, because, since it is open-source, it allows you to customize almost every part of the OS. Android users can change everything from how the icons look, to which is your default web browser and so on. iOS, however, doesn’t like to give their users free reign to change what they want. On ISO you can’t even set non-Apple-specific apps to be the default applications. So if you want to have your device just the way you like it, Android will be your best bet, because Android OS is the winner of this category. Same goes from the customization of the device itself, because Android phones, since they are produced by many different manufacturers, will provide you more options both in the devices themselves and the accessories you can get in addition to the smartphone itself, like earphones, chargers and android speaker dock stations. So if it is important to you that you can have a device that is specific to your wishes, both inside and out, then go for an Android-run phone. It is not easy to compare these two operating systems because iOS supports high-class Apple devices only, but Android supports the huge variety of devices in different price categories. This is also the reason you have to understand, that, even though iOS seems superior to Android in many ways, there are shortcomings to iOS, that could make Android the better choice for some people. So the real answer to the question in the title of this article is “none” because it all depends on the needs and priorities each of us has for their smartphones.